I know we don’t normally encourage a movie night for a date, even at home, but this one is different. The idea is to pick a really bad, B-rated movie. Believe me, they’re out there. I found one site that lists the Top 10 B-rated movies trailers of all time. Now that’s some really bad publicity, isn’t it? Set up your living/family/media room to where a love seat or small sofa is positioned front and center to your television. Make sure you have lots of cozy throws on hand. Pop some hot-buttered popcorn, open your favorite movie candy and soda then get comfy next to each other on the couch. Laugh at how stupid the whole thing is. Feed your spouse some popcorn or candy. Kiss your spouse on the ear, or any other body part that will take their mind off the bad production. Do whatever you can to make sure this drive-in movie stands up to its reputation of fogging up the windows as you make your own music, so to speak. 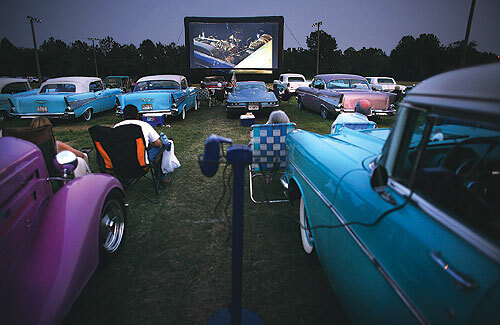 If you’ve had the privilege of going to a real drive-in movie with your spouse, you’ll know how to make this a great night. If you haven’t even been to a drive-in movie, then make up your own interpretation on this date your spouse is sure to never forget! NOTE: If you have a projection DVD player, you could even set up an outdoor theater in your backyard. Bring a blanket to lay on, and have a great night under the stars. What’s the worst movie you’ve never watched together? Taking part in the Challenge? Click on the GYRO Challenge button in the header and share with us what you did under Week #11. This entry was posted in Cheap Dates, Christian Marriage, Creative Dates, D.R.A.B., Date Night Ideas, Dating Your Spouse, Free Dates, Fun Dates, GYRO Challenge, Movie Dates, Outdoor Dates, Romance in Marriage, romantic date nights and tagged Drive-in theater, Kiss, movie, Theaters, Video projector. Bookmark the permalink. Hehe. This is a fun idea. I remember the real drive-in movies back in the 60’s. Watching a movie that way was such fun. Haha. This is AWESOME! My husband and i went on our first date to a drive in. I think this is the BEST idea ever…he would get a kick out of this. Thank you! Thanks for sharing the link, Melody. 🙂 Great post! We loved to go to the drive-in in the early 80’s. My husband drove a delivery van for work. We would put a love seat in the delivery van and back into the movie spot, open up the back door of the van, and kick back on the love seat with a quart of ice cream from our favorite drive-in restaurant. Oh my, that sounds like a wonderful date! You can recreate all of it in your living room, with the exception of the delivery van. 😉 Love the quart of ice cream treat too! Perfect for a hot evening under the stars. You’re welcome. We hope you can recreate some of the sparks of that first date, but the good news is there is nothing “off-limits”. Have fun!!! I should do this! My best friend and I definitely watched some of those B movies in college. I’m going to see if I can find Creature from the Black Lagoon or something like that to watch with my hubby.